Your character portrait conveys useful information about your character to opponents in PvP. You can’t prevent this exchange of information – but you can use your portrait to wage psychological warfare on your enemies. Consider what information is given when you target someone in the default UI: race, gender, resource type. The portrait also conveys one really important piece of information: gear level. Your helm gives your opponents a clue about your overall gear level in PvP. See, PvP gear in Cataclysm was standardized so you can approximate a character’s gear level by their health, regardless of class. (It’s been a good change, honestly.) So if you have numbers on, you can tell at a glance how geared they are. It’s important to note that not everyone has numbers turned on, and those who do may not know what the levels are. In the heat of battle they may not bother to look at all. The character portrait, though, is a big tell about gear – if they are showing a Conquest PvP helm, their gear is likely at least decent if not great. If they’re showing a crafted PvP helm, or a PvE helm, chances are pretty good that they’re undergeared or not fully geared for PvP. Now that we have Transmogrification, we can use this to our advantage. One of my favorite psychological games to play with portraits is to dress so I look weaker than I really am. Looking weaker than you are won’t fake out experienced PvPers (who will look at your health, not your helm), but mogging your PvP gear to the distinctive crafted starter sets can cause many opponents to initially underestimate you. While the visual appearance of gear isn’t everything, force opponents to look closer to see your gear level! Giving the wrong initial impression is tactically sound. If they think that you’re poorly geared and an easy kill when you’re not – great! 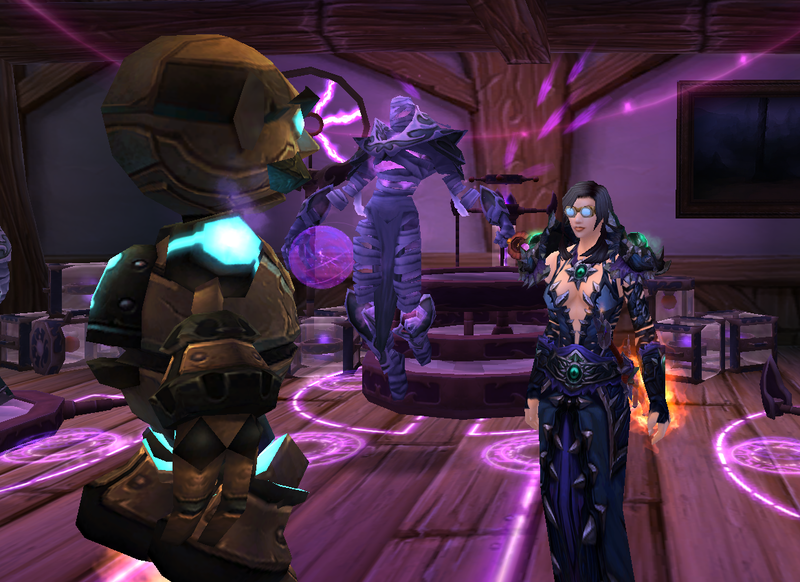 If they think you’re geared improperly – like a Warlock in Spirit gear, or in PvE gear – even better. This option works best when your gear is good to great. If your gear really is bad, though, you’ll want the next option. This is my default mode of operation – hide your helm in PvP. Doing so means my portrait doesn’t give away anything about my gear, which is good. It also allows me to show off my character’s hair, which is a plus. And it tells nothing about my gear. But it’s also wasting an opportunity to deceive opponents. When I started out my PvP gear grind this season this probably wasn’t a bad thing – hide your weakness – but now that I’m respectably geared I don’t know that I need to maintain a blank slate with my portrait. Extending this to the whole body, I try to transmog my starter PvP gear and Honor PvP gear into something else entirely different – an old vanilla set of greens, crafted Mageweave or Netherweave sets, old Northrend PvP tiers – anything to hide that you’re not quite as geared as you’re going to be. This tactic is best used while gearing up. I think the cross-faction disguises are honestly the best. I remember targeting Horde who looked like night elves in early Cataclysm – or goblins before goblins were a playable race – and wondering how the hell they had done it. It was a great tactic, because every time I targeted a night elf I thought I’d misclicked and gotten a friendly unit. Sometimes you want to intimidate your opponents. You’re in full Conquest gear and rolling with your arena team mates? Show it. Don’t mind being singled out in the battleground? Wear something distinctive on your head. Engineering is great for this, with Deep Dive Helmets and goggles galore, but there are plenty of distinctive helms which will let people know that yes, they’ve got YOU in their sights. I’ve recently hit a PvP gear level where I feel comfortable adopting this tactic again. The warlock Conquest helm is really great looking – first PvP one I can say that about since the Wrathful helm – and the outfit is killer. I don’t mind advertising that my warlock is in a lot of Cataclysmic gear, since if I get focused that usually means a healer or FC isn’t. Adopting a unique, distinctive look can have its drawbacks, though. I’m using the Flying Tiger Goggles, an early engineering schematic, which not only helps opponents quickly identify me, but also gives away my profession. You can use this to your advantage, of course – there are non-Engineer goggles out there to fake out your opponents – but it is a tell that I’ve got bombs available to me. I think it’s important to consider how you look to your opponents in PvP. Appearance isn’t anywhere near as important as, say, proper gearing and good solid play, but it’s a detail that you shouldn’t overlook. Much like which title you display, your portrait conveys information about your character and their gear. Take a few moments to think about how you’ll look to your opponent across the battlefield. Make sure that it matches the impression you want to give. Cyn, I love this post. I will freely admit to mogging my gear to look weaker than I am (I’m a disc priest in about 50% Cataclysmic, 50% Ruthless gear at the moment). 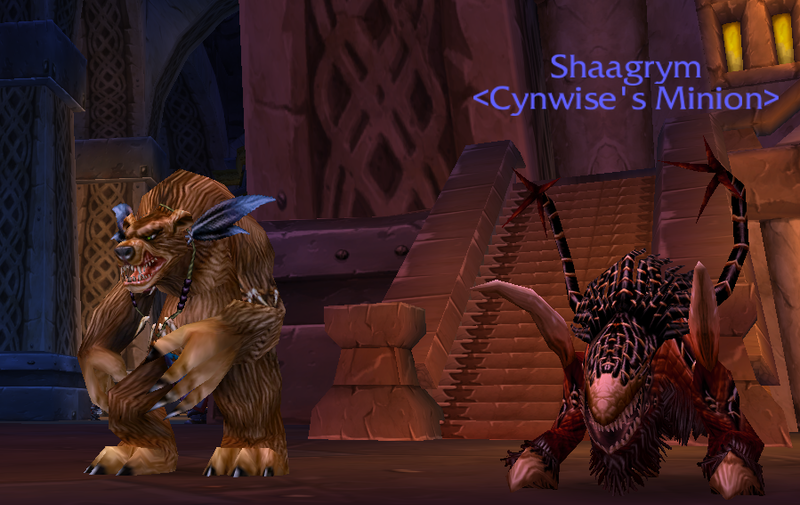 I love to frustrate and distract people (especially in the flag running bgs) and looking like easy prey is definitely the best way to lure folks to me. I’m usually sporting the Hour of Twilight PvE dungeon set (hey look at me, no resilience!) so that I look like a PvP rookie at a glance. Of course, I doubt my tactics would work so much in an arena or rated bg setting since folks in those should know better. But for the little PvP I do in normal bgs, it’s quite amazing how quickly people will lose focus to go after a presumed quick kill. Yeah, they don’t work as well in Arena/Rated BGs, but for casual BGs it’s nice to watch half their team chase you around while the rest of your team takes care of business. Unfortunately, it’s not safe to assume the character profile will even be displayed. Many people, myself included, have it disabled via addons like Pitbull/SUF/etc. In fact, a lot of the ideas you bring up here highlight why looking at a character’s visual appearance (in the world of xmog) and profile avatar are unreliable sources of information. This relegates the profile avatar to being merely cosmetic so, while it may be pretty, is better off being disabled to free up always valuable screen real estate. It doesn’t really matter if you are playing casually and just want to have something that looks neat – but a serious pvper will likely be developing a UI to present the most needed information in the most efficient manner possible which means extracting the extraneous art and filler. What you are left with is information from the target frame that is valuable but not easily gamed. Character class, name (you need something to make them identifiable as you learn their capabilities throughout the game), health, resource state, and buffs. Health is pretty much the only reliable piece of information about gear you can extract before actually facing someone in combat. If it’s a bit low they might have a lot of pve gear, or a lot of weaker pvp gear. If it’s unusually low they are probably significantly undergeared new 85s who are easy pickings. Mana pool might also give a clue to this, but not in MoP, and this is only for a few specs anyway. Resource information is more about the state – are they running oom, have they pooled a lot of focus/energy for burst, etc. Again, tweaking your resource state, health, or buffs to trick someone into misjudging your capabilities doesn’t make sense. It’s pretty reliable information. Oh, that’s a good point, and no, it’s not something that you should assume. But (especially in regular battlegrounds) you can assume a lot of people are using something close to default UIs. I always hated when Blizzard held up PvP as a reason why transmog wasn’t possible. “You should be able to identify people by their gear,” went the argument, but then why were disguises allowed? Armor identification is a good skill to have, but it’s by no means essential. Health pools, mana pools, spec-specific visuals are all more important. My priest uses the Justice Point / Heroic 346 “Lord Godfrey” gear that you have in one of your pictures – I do love the set, but I also enjoy the feeling that it might get him underestimated in PVP. Also, on my DK – who plays a very direct, “I will run right up to you and kill you right in your face, no tricks” – I like having a set that is very visible and bright and memorable. In battlegrounds, that’s my JOB, to be the center of attention and be the one other players dread seeing coming, because they know a whirlwind of Howling Blast-cleaves and relentless interrupts are a few seconds away. If that lets my teammates (hopefully a healer) slip under the radar, all the better. That’s the red set, right? Snack uses that one too. It’s distinctive (that helm is great) and it has the benefit of being both old PvE gear, and reminiscent of the lowest ranks of PvP gear. It’s a great one to use! There are some mods that color code the class a toon is, so no matter what your gear or appearance, you will know who is on the other side. I can’t recall which one of mine does it, but I think Prat does. I rely much more on the name plates to tell me class color than the portrait – but I do look up to see who I’m targeting, not the least of which to see if they’re already CCed (through OmniCC.) It’s nice that the default UI can show this without mods, although you have to configure it. Now that I think about it, I believe it’s Tidy Plates that does it. Shows the symbol as well as the color, so I know exactly who’s coming when I’m the sitting duck at the Stables. Or the Mid in EoS, for that matter. After having had the experience of shooting well off into the Nether, I avoid being on the wrong angle of any Shammy at height, such as in Iceblood Tower or (especially) N/S Stormpike Bunkers. Now I need to work on a good PvP transmog outfit for arena! Haha! I have to admit, I never thought of that kind of strategy. I suppose that I was at first getting accustomed to the PvP pace and style, now I can start working on the little details. Things like this make me glad I have given PvP a chance again. Interesting post Cyn – largely I find it interesting because I don’t pay attention to those visuals at all. I have portraits displayed even though I use SUF but I don’t actually pay attention to them at all, nor do I pay attention to the other details. I’ve not customized my look based on PvP reasons in particular, but I have maintained my crafted PvP set look on my mage despite being in all ruthless (and a couple of cata) gear, and my paladin is in vicious gear despite being mostly cataclysmic – but that is largely because I like their looks. It has always been something that fascinates me about watching the pvp videos (particularly with live commentary) is how well they keep track of their opponents buffs etc. If I don’t have a power aura for it I have trouble seeing them. Certainly some of that is my ui setup (I play zoomed out, and my ui scale is small so I can make the most use of my laptop screen). Still, if you are looking for more ideas for another PvP Playbook – something along the lines of the visual queues you make when assessing an opponent would be great! I do this mostly with other warlocks, to be honest. I look at the helm and immediately place the tier. But mostly I look at their health and figure it out from there. I’ve seen people do this in battlegrounds. I never did try to look intimidating or weak, though–all I want is to be ignored and allowed to hard cast (disc priest) as much as I like. 🙂 Not sure what look I’d have to get to achieve it–look weak and harmless so they’ll go for more dangerous prey first? But they might want an easy kill! Look dangerous so they’ll go for smaller prey first? But they might all focus fire me down (and you know how random bg people are about peeling off their own healers). I ended up just mogging for sheer looks (T6 PVP gear). My mileage seems to vary. I have found that I can become a decent decoy by riding my Flametalon. I’m going to do it anyway, because it’s my favoritest mount ever, but I have seen Horde turn and follow me because my mount is so shiny. I usually have my DK friend or crazy disc priest nearby, and it never ends well for the guy who thought he’d pick me off. I like the idea, it’s something I did with the distinctive paladin rooster helms in earlier seasons. Then I got tukui and completely stopped! I didn’t have portraits for the longest time… I look at health and mana levels now. But health can be cheated too by restoration shaman – in our 5v5 team the warrior is a bit lower geared, but the first thing I do is get as many stacks of the stamina buff on him as I can. It sometimes works! It seems recent PvE gear has quite a bit of stamina on it too, though. Caution advised! My main is a healer, and I take advantage of this! I’ve got (almost) full 403, but you wouldn’t know it from my transmog. They see an easy kill and I can usually occupy them long enough for help to arrive. Another thing you can do is try to look like another class — doesn’t always work but sometimes you’ll draw less notice if you look like a mage vs. a healer, for example.